It has a high concentration of sandalwood, as well as patchouli, notes of amber, and hints of tropical flowers. 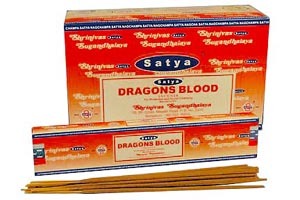 Nag Champa "Dragon's Blood" belongs to the "Champa" class of Indian incense, originating from the Champa flower. Champa incenses contain a natural ingredient indigenous to India called "halmaddi", which is a semi-liquid resin taken from the Ailanthus Malabarica tree. It is what gives Nag Champa its characteristic color. Halmaddi is hygroscopic which means it absorbs moisture from the air. This can cause Nag Champa incenses to have a wet feeling to them.